When you think of Samuel Beckett, you instantly think of Waiting for Godot. But the avant-garde writer’s repertoire is much deeper. 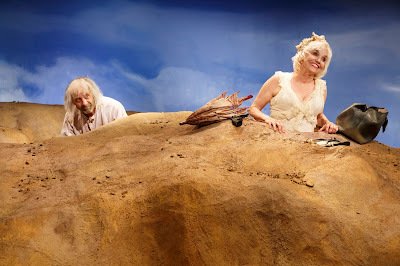 Like Godot, Happy Days is another rich language play about “nothing.” In The Flea presentation of The Theatre @ Boston Court’s production of Happy Days, Winnie is buried deep in the ground and her husband Willie is lost behind her. The Beckett two-hander follows the daily routine of two people in a play that is certainly an acting masterclass. Happy Days by Samuel Beckett is certainly absurd. It’s long and runs on about nothing. Yet there are some exquisite intricacies in nothing. The play begins with Winnie buried waist-deep in the ground as she goes about her day, pulling items from her bag, calling out for her husband, and longing for a happy day. We don’t know the circumstances as to why she’s in this predicament but Beckett makes us not care. As time creeps by, we see glimpses of her husband Willie as she reminiscences about the past. With a play so rich in implication, Happy Days is a play about the monotony of the mundane during a time of decay. This piece is certainly not for everyone. With two acts and much repetition, it’s quite possible to zone out before you enter Act II and Winnie is buried up to her neck. But if you made it through the whole piece, you can’t help but appreciate the stellar performance by Brooke Adams and the transformative Tony Shalhoub. Adams and Shalhoub, who was a wonderful support, are veterans and certainly knew how to captivate a willing audience. Adams take on the behemoth part was simply breathtaking. Adams and director Andrei Belgrader clearly took the time to map out the beats to give each moment life. Adams brought sentimentality to Winnie that made you feel for her and her situation. She made stillness vibrant. Truly a mark of a brilliant performer. While Shalhoub may be the household name draw to the piece, he brought something fantastic to the stage. The way he threw himself around and communicated through sound cannot be compared. It’s quick to say that Shalhoub had the “easy job” in this one but he was able to find ways to worth in the small part. Director Andrei Belgrader had the task of focusing on language and timing. Belgrader eased into this world, breathing life onto the stage. Happy Days doesn’t have to be completely about sorrow and Belgrader gave Winnie a truly happy day. The set by Takeshi Kata looked like a set. The mound was a theatrical mound. The backdrop was a theatrical painting. It fit the absurdist world but didn’t seem to match the vitality of Adams and Shalhoub. Yes, putting a real mound of dirt on stage isn’t quite an option but there was something off and disappointing. Robert Oriol’s sound design was like the third character of the piece. When the alarm sounded, it meant alertness for both Winnie and any potential audience member. The tone that Oriol used was absurd and fitting. Prop designer Madison Rhoades had the unique task of making the items timeless yet significant to Winnie. With a play where there is little to no action, the audience is bound to focus on the little things. And the little things of this piece are the props. Rhoades did a phenomenal job selecting and purposing the right pieces. When Winnie is examining her items, so are we. Happy Days is a play for the absurdist fan. If that’s not your cup of tea, Happy Days is a great nap. But if you’re looking for a performance that will blow you away, look no further than Brooke Adams. She is the heart and soul of this production.